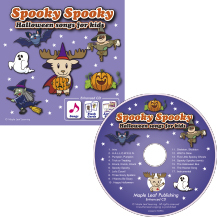 If you like Maple Leaf Learning's fun, easy to use songs, you will love this collection of Halloween tunes!. 23 fun tracks Enhanced CD includes 24flash cards, 12 verb cards several games and worksheets all in printable PDF format. 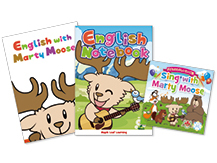 Designed to allow students to practice vocabulary, phonics, grammar and songs at home in a fun way. 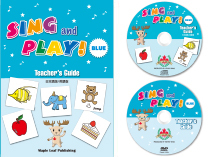 The Sing and Play BLUE Teacher's Guide contains a CD-ROM with 48 fifteen minute lessons as well as numerous printable activities to go along with these lessons. The lessons are easy to follow and adaptable to any curriculum. 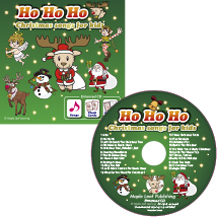 There is also a DVD that shows the songs being used in an actual classroom setting. This is a treasure trove of fun for teachers of young children! A great tool to use when training new teachers. The lessons are available in both English and Japanese. A wonderful product for not only teachers but also for parents teaching their own children at home. 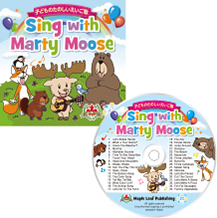 The Sing and Play GREEN Teacher's Guide contains a CD-ROM with 48 fifteen minute lessons as well as numerous printable activities to go along with these lessons. There is also a wonderful set of almost 100 printable flashcards! The lessons are easy to follow and adaptable to any curriculum. 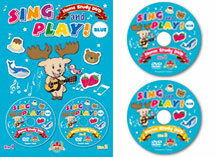 There is also a DVD that shows the songs being used in an actual classroom setting. This is a treasure trove of fun for teachers of young children! A great tool to use when training new teachers. The lessons are available in both English and Japanese. A wonderful product for not only teachers but also for parents teaching their own children at home.